The wind whipping through your hair, the roar of the engine, the jostle of the bumpy ride. These are the things that most people think of when they remember their first ride in a Hummer. But I think of all the cool things that I learned about the desert. Often, when you are taking a guided tour through anything – be it a museum or in this case a Hummer – it’s the guide that adds or detracts from your enjoyment of the experience. Dull, monotone voice versus excited, enthusiasm. It really makes the difference! This is so true in the case of our Hummer ride through Tonto National Forest. Without our guide Brian of Desert Dog Adventures – it just would not have been the same. Our adventure started when the H1 Military Hummer arrived at our front door. The entire Hummer fits a total of 8-10 people in seats that span 4 seats across. I’ve never been in a multi-levelled, w-i-d-e vehicle like this before – I’m petite but in this, I felt so very tiny! Hubby and Brian immediately started talking cars and here’s what I gleaned from their conversation. H1 Hummer was designed in the early 1990s to be a true Military Hummer, but due to demand, they started selling them to the public. They are no longer making them, and no longer make repair parts for them. To facilitate this need for parts, the resourceful team at Desert Dog Adventures created their own workshop with mechanics on site where they build their own parts, make repairs and customize their own vehicles to suit their needs. No parts indeed! I was relieved that the temperature had dropped on the day of our ride and that we had a nice breeze with the windows open because, the air conditioning was not functioning in the Hummer and I was told, hasn’t been for a long time. But hey you are in a Hummer in the desert and having the windows open and the wind in your hair just adds to the ambience of it all. 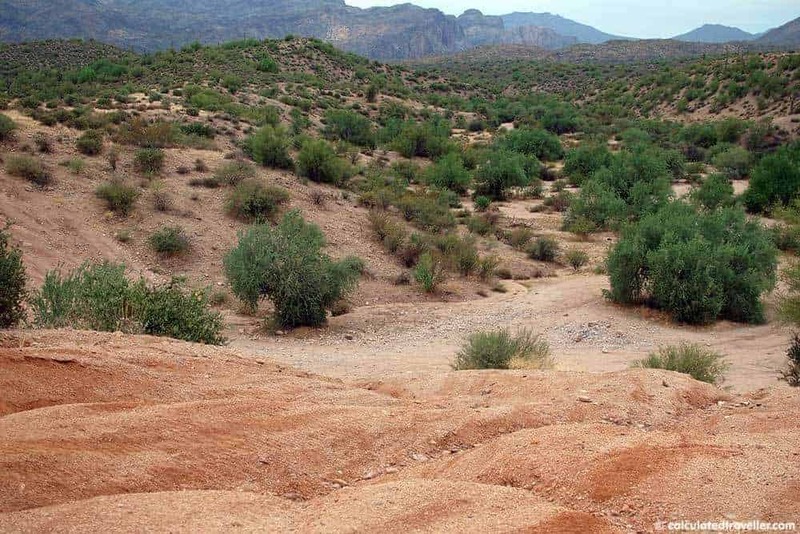 Crocodile Dundee – but the Arizona version – and without any crocodiles! A pure educator at heart, Brian’s eagerness to teach was obvious when he explained why the jumping cholla cactus (pronounced choy-a) is the frenemy (friend/enemy) of the desert. 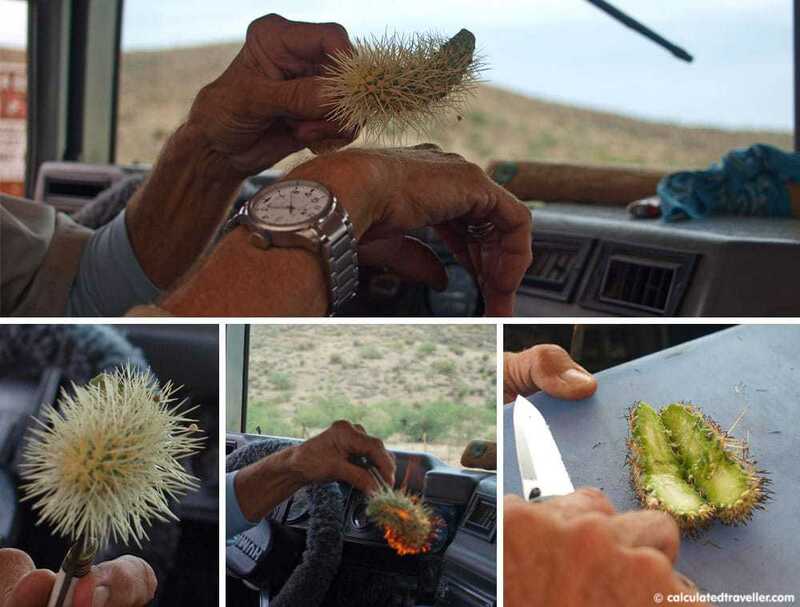 Brush against the cactus and the tips, which are like hypodermic needles with hooks at the end of their spines, will lock into place under the surface of your skin – OUCH – and will stick to you like velcro. The flesh, however, Memory Monday – Desert Botanical Gardens, Phoenix, Arizonais full of vitamin C and electrolytes so if you are lost in the desert this is a great form of survival food. Don’t try this at home folks, but Brian then proceeded to let it touch his skin to prove the “velcro effect”, while we squealed in horror (okay – I admit, it was only me who was doing the squealing). He’s a pro so he knew how to do it without injuring himself. How do you make the cholla less of an enemy? To get past the spines, set it aflame and then you can safely cut it open and eat the flesh. We were offered a taste but we all passed up on the offer! The next thing you know, we are driving by a Jojoba bush and Brian stops the car and jumps out to grab us each a bean and starts to explain “Jojoba bean is famous for its oil which is actually a liquid wax. It’s used in cosmetics”. 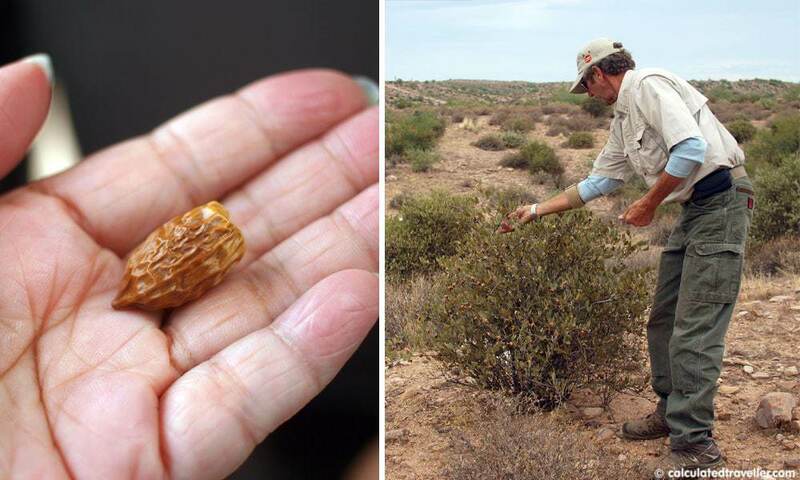 The mesquite tree found all over Arizona has one of the smallest leaves in the world. Its bark is green to aid in photosynthesis and compensate for the small leaves. There are approximately 16 types of snakes in Arizona – the Mojave being the most dangerous. There are approximately 2,500 different types of flora in Arizona. Truth be told, I didn’t love the Hummer ride – it was good fun with a lot of jostling about. But what I LOVED was the personality and willingness of our Guide Brian to teach us something about what we were seeing during our half-day glimpse within this gorgeous 3 million acre forest. 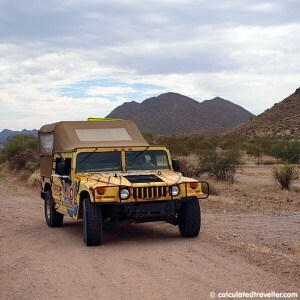 Desert Dog Adventures also offers Hummer Night Tours, U-Drive C2 Desert car Tours through the Sonoran Desert which look like great fun! 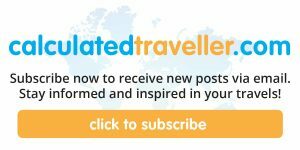 Read other reviews of Desert Dog Adventures on TripAdvisor. 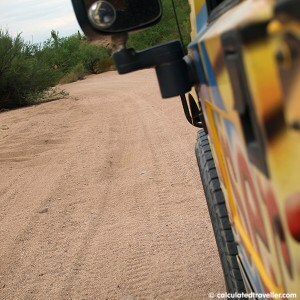 Note: Thank you to Brian of Desert Dog Adventures and Viator. This was a complimentary tour in exchange for this review. The opinions expressed, positive and/or negative, are entirely that of the author and are not a reflection of the compensation received. Have you ever learned something really cool in an unexpected place? Why didn’t you try the cactus? I bet it tastes like chicken. 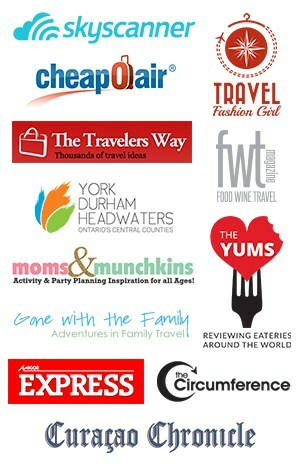 =) Interesting post, I learned a few things. Thanks for sharing. I know Elaine… DOH! I do wonder if it tasted like chicken hmmm…. Actually we were told that it was similar in taste and texture of kiwi. You didn’t try to eat cactus? I don’t understand! That would have been an awesome experience! Although it sounds like you had a blast, regardless. We did a hummer tour in Las Vegas and it definitely is a whole lot of jostling about. But also really fun to see some remote parts of the desert. SO true Jennifer. There is no way that you can get into that portion of Tonto without being in a hummer. Thanks for your comment.